What is Ringworm or Tinea corporis? Tinea corporis is commonly known as "ring worm." Tinea corporis is the term used for fungal infection of the skin. The fungus causes a characteristic lesion which is often clear in the center with a rough, scaly, circular border. 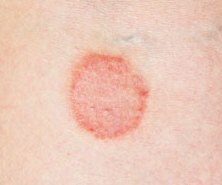 The lesions vary in size from very small circular patches to very large patches. Tinea Corporis is small, itchy round red spots with scaly, slightly raised borders. They tend to clear in center as they expand. •	Skin rashes that are ring-shaped or oval and the edges are red and scaly. •	Rashes can become dry and itchy. •	The edge of the rash appears elevated and is scaly to touch. •	Mostly ring rashes appears at arms, legs and face. Tinea Corporis is usually transmitted through contact with animals such as dogs, cats, calves, hamsters, and guinea pigs. It can also be acquired through person-to-person transfer which would usually be via direct skin contact with an infected person. The fungus prefers hot and humid conditions and where those conditions prevail it can be transferred through contact where someone with an infection has been also had contact: Eg, swimming pools or showers or even sharing personal items like combs or clothing. Most mammals have at least one type of fungus, and usually the animal and fungus live in peaceful coexistence without the animal ever showing any symptoms. This does not mean that the fungus cannot be transmitted to humans. Children are particularly susceptible to tinea corporis and can pass it on easily to other children. Adults can also become infected. Farmers and people who work with animals that have fur are at increased risk. Is Tinea Corporis contagious ? Yes, tinea corporis is very contagious. •	Good general hygiene helps prevent Tinea Corporis especially washing your hands well after contact with animals or plants. •	Avoid contact with infected area on other individuals. •	Avoid contact with infected pets as much as possible. •	Wear loose fitting clothing. •	Do not use steroid creams on the rash they will only make it worse. •	Do not use clothing or cosmetics items of other personal items such as combs or towels of anyone who may have an infection. •	Tinea corporis usually clears up quickly when antifungal medicines (such as ketoconazole) are applied twice daily to the skin. If it doesn't, you may need one month of treatment with the antifungal antibiotic, griseofulvin, taken by mouth. •	Recurrences can be treated with Lamisil cream this does not need a prescription and is very effective for control. •	Tinea Corporis can be treated by using an antifungal cream or by taking antifungal tablets. A strong immune system is one of the best defences against having a ringworm infection so Vitamins and minerals are very useful in protecting yoruself and your family. The Cellular Nutrition products I am going to recommend you make use of knowledge gained from the botanical world's 6,000 year history. They incorporated health building nutritional herbs with the best modern technology to help our bodies cleanse and detoxify so that the cells - the tiniest living units - can be as fully nourished as possible. General Health Indicators. Once the body begins to clear itself of toxins it can more efficiently absorb nutrition. Further reading through our articles on Ringworm health issues will give you a body of information that will help you decide what options you have to deal with the underlying causes of your problem through giving your body the nutrition products that will assist you body to heal from the inside out. We wish you well in your search for solutions to this Tinea corporis problem and your movement towards better health in all areas. SITE DISCLAIMER: Do these products “cure” anything? Of course not… but it stands to reason that if you cleanse your body and feed it the finest nutrition available, giving it everything it needs in balance, on a daily basis, that your body will do what nature intended, and give you the best possible chance to fend off sickness and disease. This Ringworm your health online information is not presented by a medical practitioner and is for educational and informational purposes only. The content is not intended to be a substitute for professional medical advice, diagnosis, or treatment. Always seek the advice of your physician or other qualified health provider with any Ringworm questions you may have regarding a medical condition. Never disregard professional medical advice or delay in seeking it because of something you have read. Any natural and/or dietary supplements that are not FDA approved or evaluated must be accompanied by a two-part disclaimer on the product label: that the statement has not been evaluated by FDA and that the product is not intended to "diagnose, treat, cure or prevent any disease”. The Ringworm resources on this your health online site are not intended to be a substitute for professional advice. While all attempts have been made to verify the ringworm information provided in this publication, neither the ringworm author nor the publisher assumes any responsibility for errors, omissions or contrary interpretation of the web site Ringworm subject matter herein. The what is Ringworm your health online site Ringworm contents are solely the opinion of the authors and should not be considered as a form of advice, direction and/or recommendation of any kind. If expert advice or counselling is needed, services of a competent professional should be sought. The what is Ringworm author and the Publisher assume no responsibility or liability and specifically disclaim any warranty, express or implied for any products or services mentioned, or any techniques or Ringworm practices described.